As we approach the Jewish New Year, traditionally a time for reflection on our deeds, what we mean by the Jewish nature of the state of Israel is on the scales. 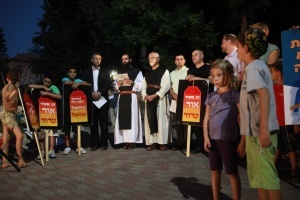 Last night I attended a “Tag Meir”(“Spreading the Light”) event at the Benedictine Monastery in Latrun, a solidarity visit in response to the despicable desecration of the monastery by “Price Tag” Jewish extremists. Important as it undoubtedly is to express support for those targeted, and despite the moral imperative I feel to express public outrage at these abominations, it also feels increasingly futile as a response to the fear and hatred of the Other that is sweeping across Israel. I’m sure this isn’t an exhaustive list – no doubt there are all sorts of examples I have forgotten about or that are yet to be revealed – but it’s certainly enough to give us pause for thought. And sadly, almost all of these expressions of fear are particularly prevalent in Orthodox and Ultra-Orthodox circles – and often given religious authority by so-called Rabbis. If this is the Judaism of the Jewish state, I want no part of it. It is time to stop being tolerant of racism, sexism and all-round bigotry under the guise of religion. Whether it’s tradition or not, it’s wrong and it’s time to put an end to it. We can no longer kid ourselves that it’s just a few ‘stray weeds’ – it’s not, it’s taken root, deep root, in the very foundations of the state and in the heart of government. My dream of a Jewish state is a state that espouses the liberal, pluralist values I hold dear, a state based on enlightened ideals of “love thy neighbor” and social justice. If I have to decide between democracy and Jewish bigotry, I know what I choose. We must act now before we are forced to make the choice. It’s wonderful to hear from you again after the summer silence! But what a gloomy report. Just as we try to encourage an Islamic reformation you report on the rising tide and influence of Jewish orthodoxy. Meanwhile our children continue to consider at school debating societies whether ‘religion does more harm than good’ and the vote is not going our way… Keep up the good work; we’re right behind you, even though sadly a few thousand miles behind. Sorry I am not there at the moment to add my “disgust” and dismay. Certainly this is not what Judaism is all about nor what should be taught ..too bad there are many who “just don’t get it”!! !